Petroleum Minister Diezani Alison-Madueke said that those calling for her exclusion from the next cabinet are doing so because she has created a level playing field that has denied them the opportunity to defraud the country through the oil and gas sector. Fielding questions from newsmen at the State House, Abuja, against the backdrop of criticism mounting against her nomination as a minister in the next dispensation, Alison-Madueke insisted that there is no going back on the ongoing reforms of the sector. 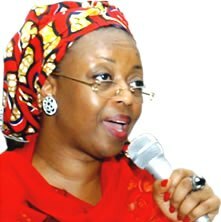 She said, "They are fighting President Jonathan because since assuming duties as president of this country he has taken the uncharacteristic step to break the cartel in the petroleum sector that had almost strangulated the economy for over a decade. That is why the frenzied and sudden campaign of calumny by the cartel, all in a bid to deter me from carrying out Mr. President's reform agenda." She said Nigerians would not allow a small group of individuals to deprived millions the benefits drivable from the oil sectors. She also described the corruption allegations against her as one of the tricks deployed by her enemies to derail her efforts in transforming the oil and gas sector. "I would not want to join issues with those criticizing me because they are crying foul that through us Mr. President has broken the old order where the common man had to spend nights on queues in petrol stations and pay higher prices for products. We have also ensured that the business in the entire oil and gas industry of the economy is no longer business as usual. They can no longer undermine government's good intentions for the sector and cause untold hardship for millions of our people," she said adding that the ministry under her leadership has also initiated a 24 months rehabilitation programme for the three refineries in the country. She maintained that this was the first time the Nigeria National Petroleum Corporation, NNPC, "is undertaking such gigantic and extensive rehabilitation project without asking the Federal Government for funds." The minister said "once the comprehensive rehabilitation of the refineries is completed, the country will considerably reduce importation of PMS (Petrol) and become self-sufficient in kerosene and diesel production, thus ending the long years of sufferings of the ordinary Nigerian".